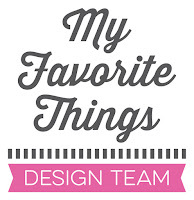 Hi everyone!It’s time for the October My FavoriteThings release replay! Today, the MFT design team is taking a fresh look at the most recent release. I used a beautiful gingham paper from the Tiny Check paper pack for the background. The frame is from the Single Stitch Line Rectangle Frames Die-namics. 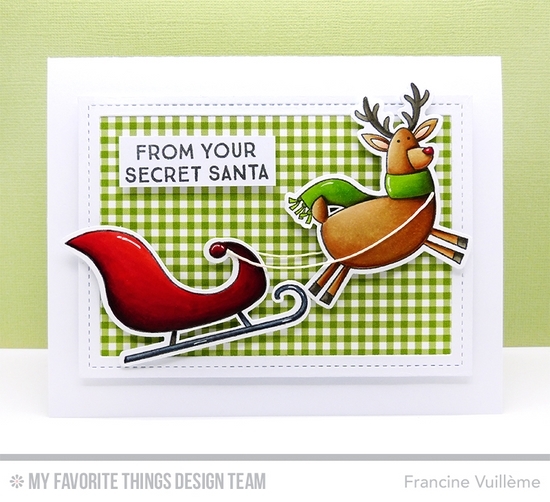 The "From your secret Santa" sentiment is from the Gift Tag Greetings stamp set. I made the reins with hemp cord. I stamped the images with Black Licorice hybrid ink. I colored them with Copic markers and cut them out with the coordinating Die-namics. Such a sweet card, Francine! I think I always say the same thing, but it's true...your Copic coloring is amazing, and your crisp, clean design is fabulous! You sure know how to inspire us :) LOVE this! Adorable! Love how the scarf brings out the background. Love the green gingham background idea for Christmas...will use this. Darling card. Francine, Love the Gingham paper with this! Your hemp reins is pure genius! And, as usual, your Copic work is AMAZING!